Life was hard for an Appalachian coal miner and his family in the 1920s and 1930s. So it was for Lloyd “Whitey” Moore. His father died when the lad was 13. He and his older brother Lester dropped out of school and found employment to support their mother and younger brother. Because he could throw a fastball as fast as almost anyone on the planet, Lloyd Moore did not linger long with the railroad. His blazing fastball enabled him to pursue a career in baseball. 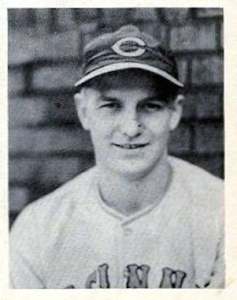 He signed with the Cincinnati Reds and started his professional career in 1934 with the Jeannette Reds in the Class D Pennsylvania State Association. His 12-6 record there earned him a midseason promotion to the Beckley Black Knights in the Class C Middle Atlantic League. He did not fare too well in Beckley (1-4), so he started the 1935 season back in Class D with the Mount Airy Reds in the Bi-State League. The lower minors couldn’t hold him, and he earned two more promotions during the year, first to the Wilmington Pirates in the Class B Piedmont League, then all the way up to AA and the Toronto Maple Leafs in the International League. In 1936 he followed the same pattern, starting out in the low minors and earning promotions during the season. He began the season with the El Dorado Lions of the Class C Cotton States League, where he compiled a sensational 20-5 .800 record with a 2.33 ERA. He led the league in strikeouts and very nearly had a no-hit, no-run game against Pine Bluff. With two out in the ninth, he had two strikes on the batter, who lifted an easy looper over first base, barely out of the fielder’s reach and spoiled the no-hit bid.4 He finished the season with the Macon Peaches of the Class B South Atlantic League, where he went 2-2. These performances warranted a September call-up to the big leagues. Now called Whitey because of his light blonde hair, Moore made his major-league debut in Pittsburgh on September 27, 1936. The 24-year-old right hander stood six-foot-one and weighed 195 pounds. His debut came on the last day of the season and featured an unusual occurrence. Dee Moore, a fellow September call-up started the game for the Reds, the only time he was ever a starting pitcher in his major-league career. After hurling two scoreless innings against the Pirates, Dee Moore switched positions, replacing Ernie Lombardi as the Cincinnati catcher for the remainder of the game. It was one of the few times in the history of baseball that a major leaguer had pitched and caught in the same game. Whitey Moore took the mound in the third inning and promptly gave up three runs. Then he settled down and held the Pirates scoreless for the next four innings, receiving credit for the win in Cincinnati’s 6-5 victory. By 1938 Moore was back in the majors. He stayed five years this time. By 1938 the Reds had started their recovery from years of second-division finishes. Under the innovative leadership of owner Powel Crosley Jr. and general manager Larry MacPhail the Reds had acquired some capable players and promoted others through the farm system. Perhaps most important of all they had secured the services of Deacon Bill McKechnie as field manager in 1938, after finishing last in ’37. In his first season at the helm, McKechnie brought them their first first-division finish since 1926. Moore benefited from McKechnie’s wisdom. In one game Whitey became overly disturbed by an umpire’s call that went against him. The manager removed the pitcher from the game and gave him some fatherly advice. “If you’re angry, you can’t think, and if you can’t think, you can’t pitch for me.” 6 Moore compiled a 6-4 record in 1938. The next year he had his best season in the majors, winning 13 games as the Reds won their first pennant in 20 years. Cincinnati had by far the best pitching staff in the National League that season, leading the loop in wins, complete games, strikeouts, and ERA. Bucky Walters and Paul Derringer were the Reds best pitchers, but Whitey Moore and Junior Thompson made major contributions. In the Game Three of the 1939 World Series against the Yankees, Moore relieved Lee Grissom, with the Reds trailing, 7-3. He retired Red Rolfe, Charlie Keller, and Joe DiMaggio in order. He pitched three shutout innings, allowing no runs, no hits, no baserunners, and striking out two. That was his only appearance in the four-game Series. In 1940 Moore was again used both as a starter and reliever. He contributed eight victories as the Reds won 100 games for the first time in the long and distinguished history of baseball in Cincinnati. The Reds cruised to their second consecutive National League pennant and faced the Detroit Tigers in the World Series. Moore was used exclusively in relief in the Series, pitching in a total of 8 1/3 innings in Games One, Three, and Five. In Game One he replaced Paul Derringer in the second inning, with two men on base, one out, and the Reds trailing, 5-0. He prevented the inherited runners from scoring by retiring the first two batters he faced, Hall of Famers Charlie Gehringer and Hank Greenberg. He gave up two runs in the fifth inning, and was taken out for pinch-hitter Harry Craft in the eighth inning. The Reds lost the game, 7-2. In Game Three Moore relieved Jim Turner in the bottom of the seventh with nobody out and the Reds behind, 5-1. He allowed two hits but no runs. Lew Riggs pinch-hit for him in the top of the eighth. The Tigers pounded relief pitcher Joe Beggs and won the game, 7-4. In Game Five Moore replaced Thompson in the bottom of the fourth with the Reds trailing, 4-0, two runners on base and one man out. He walked two and allowed one hit, permitting two runners to score, but only one run was charged against him. He was taken out for pinch hitter-Lonnie Frey in the fifth inning. The Reds lost the game, 8-0. Moore did not pitch again in the 1940 World Series. He had given up a total of eight hits, six bases on balls, and three earned runs. He led the club with seven strikeouts. He had no wins, no losses, and no saves. Cincinnati lost all three games in which he pitched, but none of the losses was his fault. In each instance he entered the game with the Reds behind and unable to catch up. However, Cincinnati won the four games in which Moore did not pitch to take the seven-game World Series and bring the Queen City its first world championship since 1919. Moore played sparingly in 1941, pitching mostly in relief and compiling a 2-1 record. On May 6, 1942, he was traded to the St. Louis Cardinals for relief pitcher Clyde Shoun and cash. The trade turned out to be hugely beneficial to Cincinnati, as Shoun posted a 14-5 record and led the National League with 13 saves in his first full season on the banks of the Ohio. Meanwhile, Moore was of little or no help to the Cardinals, neither winning nor saving a single game for St. Louis. Moore made his final major-league appearance at the age of 30 on September 7,1942, at the same place he had made his major-league debut six years earlier, Forbes Field in Pittsburgh. He pitched the seventh and eighth innings and set the side down in order each time, ending his career on a positive note. During the war years Moore remained the property of the St. Louis Cardinals. After the war he tried a brief comeback with the Rochester Red Wings, the Cardinals farm club in the International League. He won two games and lost seven in 1946 before giving up professional baseball at the age of 35. Following his retirement from baseball, Moore returned to Tuscarawas County, where he worked as an assembler for the Warner-Swasey Company, an industrial plant in New Philadelphia, the Tuscarawas county seat, until 1977. He remained in his home county with his wife, the former Frances Jane McClelland until her death on August 26, 1984. The daughter of a machinist in Uhrichsville, Frances was a lifelong resident of Tuscarawas County. Most sources indicate that Lloyd Albert Moore died at the Beacon Point Rest Home in Uhrichsville on December 10, 1987, at the age of 75. However, it is likely that his death actually occurred in Aultman Hospital in Canton, Ohio.9 While in the rest home he became seriously ill, and he was taken to the hospital in Canton, in adjacent Stark County, for his final days. Whitey and Frances Moore are buried side by side in the Union Cemetery in Uhrichsville. They were both born in Tuscarawas County, called Tuscarawas County their home during their entire lives, and will rest forever in that scenic county in the Appalachian Plateau. In addition to the sources listed in the notes, the principal sources used were Baseball almanac.com and Baseball-reference.com. 1 Public member trees, ancestry.com. 2 C. Edward DeGraw, The Only Game in Town: A History of Baseball in Tuscarawas County, Ohio, 1867-1955 (New Philadelphia, OH: Tuscarawas Historical Society, n.d.). 3 Major leaguers from Tuscarawas County include Bob Addis, Frank Baumholtz, Frank LaPorte, Al Mays, Frank Moore, Whitey Moore, Larry Schlafly, Al Veigel, Dave Wright, and Cy Young. 4 The Sporting News, July 29, 1937. 6 Talmage Boston, 1939: Baseball’s Pivotal Year. (Fort Worth: Summit, 1994), 76. 7 U. S. World War II Army Enlistment Records, 1938-1946. 8 U. S. Department of Veterans Affairs, BIRLS Death File, 1850-2010. 9 Bill Lee, Baseball Necrology: The Post-Baseball Lives and Deaths of More Than 7600 Major League Players and Others (Jefferson, NC: McFarland, 2003), 282.